Roasted Broccoli Peanut Noodles | Naturally.Roasted Broccoli Peanut Noodles | Naturally. 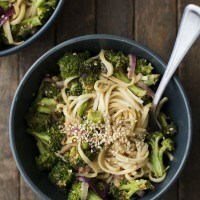 An easy noodle bowl filled with roasted broccoli and an easy peanut sauce. Perfect for a quick lunch or light dinner. Preheat oven to 425˚. Chop broccoli florets into bite-sized pieces and toss with onion and olive oil. Roast for 20 to 25 minutes until broccoli is tender and starting to brown (see note). While broccoli is roasting, cook noodles according to package. To make the sauce, combine the ingredients in a bowl and stir until smooth. Once broccoli is done roasting, combine with noodles and sauce. Toss until well combined and serve with a sprinkle of sesame seeds. + Roasting the broccoli leaves it still a bit crisp. If you desired more tender broccoli, try blanching for 3 to 4 minutes before roasting. + This makes minimal amount of sauce (it’s more of a light coating). Double the sauce portion if you would like more. + For the roasted broccoli, I center my oven rack and like it a bit more on the well-done side. If you’re concerned about over roasting, start checking around 10 minutes and continue to cook until broccoli is at your desired doneness.